Brand New BONPEN, BON-102S, microfine pen-tip type has launched. Now you can select your favorite from among total 7 kinds of pen tips. 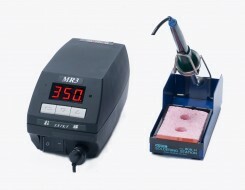 Brand new soldering iron with 175W high power Wide range of soldering iron tips in 2 different sizes, TB-1175 is able to achieve multiple soldering operations.. Copyright © Japan Bonkote Co. Ltd., All rights reserved.